Fr. Andrew surveys Mormonism in his series on Non-Mainstream Christianity. On this Sunday, Fr. Andrew asks if we can use our feelings as a test of the authenticity of our Faith? 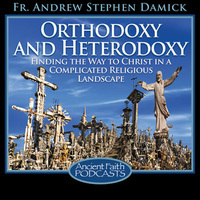 A talk given at the Orthodox Homeschooling Conference (Apr. 23-26) at the Antiochian Village. Fr. Andrew introduces us to the historical roots of the Pentecostal movement. On the feast of St. Joseph of Damascus, Fr. Andrew tells us his story and asks how it pertains to our own stories.